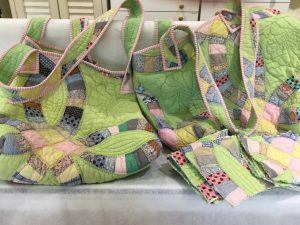 Since Memorial Day weekend was supposed to be pretty much a washout weather wise I planned lots of creating time. 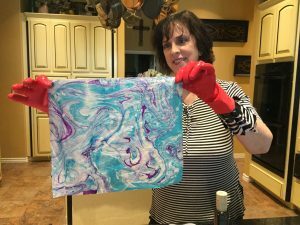 First I experimented with fabric marbelizing which I tried once before with my friend Sharon. 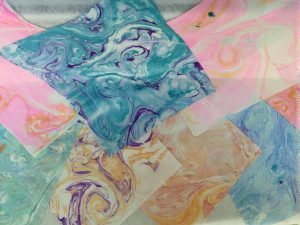 There is lots of prep work for this technique but the results were pretty. Dont let the name fool you. 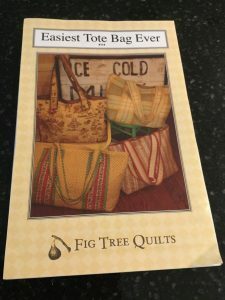 It IS easy as far as construction – no lining or closures BUT the handles and the top of the bag have to be bound like a quilt and since I only do mine by hand that was a lot of hand sewing! I am very happy with it. I made one years ago and still use it as it holds a lot even a full quilt! 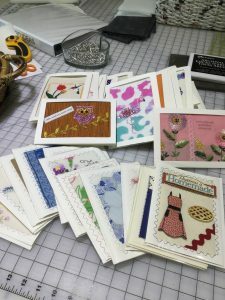 And what is a sewing marathon without cards? More going to Windway Gallery on Thursday. Making cards is my happiest creative time. I hope all of you had a restful Memorial weekend and thank you to those who serve or have served in the military. I love the things you made from this quilt. Are you selling them anywhere?